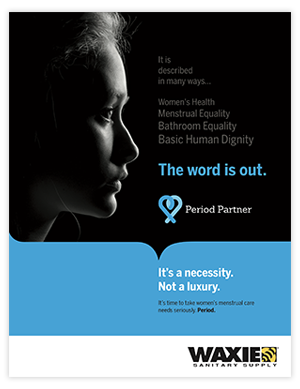 On October 12, 2017, Governor Jerry Brown signed Assembly Bill 10, requiring middle and high schools where at least 40 percent of students meet the federal poverty threshold to stock half their campus restrooms with free menstrual products. In an effort to keep low-income students attending class during their menstrual cycles, California schools will provide free tampons and pads. A similar measure implemented in New York in 2016 proved to successfully reduce absenteeism in public school systems. WAXIE is here to help with implementation. Menstrual care is part of what constitutes a well-appointed restroom, one that has public health at its core. 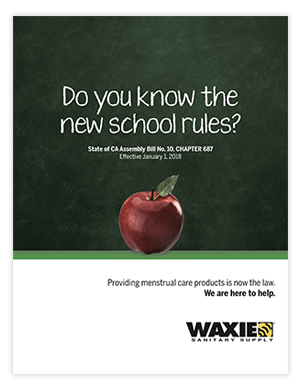 We make the change easy for you by offering a complete site analysis for restrooms in your facility — or even district wide, and our simplified product selection makes WAXIE a single source. Supplies such as paper towels, bath tissue, seat covers and hand soap are required – what about menstrual care products? Q: When was the bill signed into law? Q: When does the school need to have dispensers and products? Q: Are there other similar laws in US? Q: What has been NYC Schools experience? Q: My school customer is concerned that products will be overused and abused – what options are available to address this concern? The new Evogen dispensers have a patented time delay mechanism which can assist with mitigating this concern. Q: What are the various dispenser options?